You have no doubt read countless articles on the price of gold costing “x dollars per ounce” and possibly own a gold ring or some other piece of gold jewellery but do you really understand exactly what you own? What’s the difference between 1 troy ounce of gold and 1 (regular) ounce? What’s the difference between 18 and 10 karat gold? Let me explain. Written by Lorimer Wilson of munKNEE.com – Your Key to Making Money! The term used to describe the unit of measurement for the proportion of gold (i.e. % purity of the gold content) in a piece of jewellery, coin, ingot or bar as per the above table. Gold will often be mixed with “filler metals” such as silver, palladium, platinum, nickel and even copper to combat the softness of pure 24 karat. Gold which contains a degree of silver, platinum or palladium is referred to as ”white gold” and will classify with a higher amount of karats while the presence of nickel leads to a slightly lower designation of karats. Copper is used to give gold durability and give it a golden rosy tone. Below is a table outlining the karat designations at various gold purity levels plus the extent of ”fineness” as is used in some countries such as Italy. 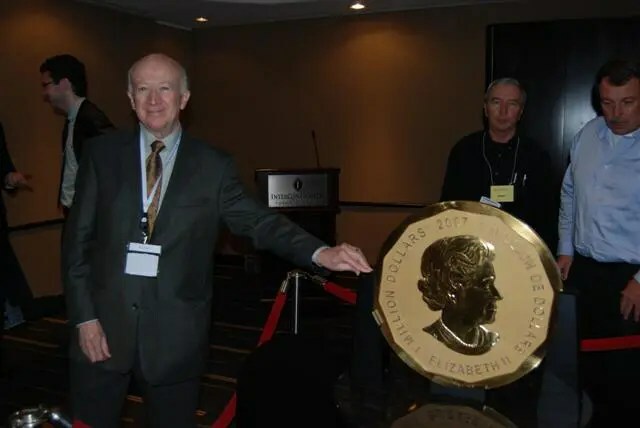 munKNEE.com Editor-in-Chief Lorimer Wilson with the world’s first 100-kg, 99999 pure gold bullion coin with a $1 million face value. It was produced by The Royal Canadian Mint. The troy ounce (ozt) is a unit of imperial measure most commonly used to gauge the weight and therefore the price of precious metals. One troy ounce is equivalent to 1.09714 avoirdupois (our conventional every day measurement) ounces i.e. 9.714% greater in weight and 1 kg. consists of 32.1507466 troy oz. Please keep the distinction between ounces and troy ounces in mind when buying small quantities of gold and/or silver.